Life at home is fragmented, revolving around the milk-expressing schedule which is once every 3 hours. That means that 24 hours a day is divided into 8 periods of 3 hours each. For every period, at least 1 hour is devoted to milk-expression. Less than 2 hours is then used for sleeping, eating, shower, housework, checking email/ work, washing/ sanitizing milk-expression pumps and bottles, monitoring stock market, watching some TV, racing through a few pages of newspaper/ book, tending to my 2 elder kids etc, what ever the priority of the time is. That means that the most sleep per session I get is less than 2 hours a time, and most days i get no more than 6-7 hours in 3-4 sessions. Baby V had moved from NICU to Special Care Nursery (SCN) when she no longer needed oxygen supplement via CPAP. She's looking much better, having slowly been filling out over the last few weeks. Her fingers no longer looks like wrinkled dried chillis, and looks like fresh chilli now. I visited Baby V for the first time since my discharge from KK. Her weight then was 1160 gm, having shrunk after delivery, per normal expectations. Her eyes were huge... and it hit me again that it was because her face was too thin. After days of being optimistic and hopeful and putting on a brave face, I was finally broken. All from a simple work-related call while home. I was not. I'm on maternity leave. Then I tried to deflect it and asked about his recent holiday. BUT he continued to asked about me and my baby, and I broke down. Somehow, having to verbalize the situation made it much more "Real" and it showed up starker as opposed to texting it or blogging about it, especially to a non-related party outside of immediate family and close friends. To his credit, he was very kind (I think he had a soft spot for me for my work with him) and took it all in without being showing that he was too mortified by this sudden turn in conversations, in fact sharing with me that his daughter was born prematurely too, spent 2 weeks in NICU and is now 3 years old without any ill effects. We ended the conversation on a more professional note, after I had regained my composure and giving him a verbal report of the progress of the subsidiary's activities and further action plan. Was only able to see Baby V the 2nd day after delivery as I was still unsteady on my feet (from blood loss during labour... TMI? ermmm... that's reality for ya!) and deemed unable to make my way by myself to NICU. Was wheeled there by E when he visited in the afternoon. She was housed in an incubator which kept her warm and toasty, and which allowed access only through pot holes for us to insert a cautious (washed, scrubbed and sanitised) finger to touch her fragile skin. But even as my heart aches thus, I could not get away from noticing the other babies in the same cubicle as Baby V. Some were just 700+ gm when born, and the smallest was only 675gm... Baby V, while small, is exactly TWICE that of this baby... oh poor things. E who had already made a tour of the cubicle duly informed me that Baby V was the heaviest of all babies there. But I spied a baby at the corner with a birth weight of 1410gm and told him so. E's PFS* kicked in and dismissively said, "oh yah, but Baby V is TALLER, that baby is only 39cm tall but Baby V is 41cm long." And I thought it was another routine couple of days' stay at the hospital to stop the bleeding and I could go home / back to work after that. 24hrs later but 73 days early, Baby V was born. It was a stressful couple days preparing the big audit by our HQ, and I've worked hard staying late most of the week before. Right after the 2 day presentation and meeting, all were satisfied and we went for dinner. I drove home after dinner and rested. But I noticed some blood clots and immediately got E to send to me my gynae's hospital (un-named due to possible repercussions). On the way there, I felt cramps and thought this MUST be false contractions, I am WAY TOO EARLY to be starting labour. But when we were there, I was indeed in labour. 4 cm dilated to be specific. I was given Dexsar to help the baby's lungs develop faster to adapt to the breathing in air world. The hitch was the medication needed 2 doses administered 12 hours apart, and a total of 24 hours for it to work fully. We may not have that much time. I was put on sabutamol to relax the womb and hopefully buy some time. We frantically pulled on strings to move me to KK where I hope to get into a C class ward, but KK told the doctors that they were full and I will not be excepted if I were to transfer there. We tried NUH and SGH where both are going to be more expensive than KK, but have a system for reduced charges once fees hit a certain ceiling. It was passed 12mn, and I woke up my parents. Demanding over their protests to wait till a more godly hour like when the sun is up that they pull on some very distant strings, waking several families in the mean time. And the final verdict was to have me change back into my street clothes and transfer to KK in a private ambulance (making no mentions of the hospital I came from) and just show up at KK A&E. The delivery was thought to be imminent and my gynae and padae were worried enough to hop into the ambulance with me and deliver the baby in the ambulance if necessary. I can't tell you how gratified I was with their unselfish thoughtfulness and professionalism, and the comfort in thought that they were there. There was some grilling at KK admission, and was told that if not for the dire circumstances that I was in and being unfit to be moved, I would have been moved for there were not enough ventilators. But thank goodness the long distant strings were pulled and favors were granted. No time were lost even during the questioning, and I was quickly changed and examined. I was given another dose of dexsar at 230am. The doctors dithered with their administration of sabultomol in increasing dosage of 15ml per half hour due to the side effects (both short term and long term) on the heart. But I pleaded with them to up it to the max that my heart could withstand ASAP, before the window closes and the tipping point reach, where too little too late was given before the labour proper starts and the baby would have lost all fighting chance (time) for her lungs to be ready. They agreed with me, but not before counselling us on the pros and cons, and amongst them... we have 2 other children. The very stark message being, they were responsible for both mother and child, but they judged it to be more important to have 1 mom + 2 kids than 3 kids with no mom. Yes... but still. They upped the sabultamol. The next 20 hours were filled with waiting, where waiting was good. I was prescribed anti-biotics, blood drawn for various tests, monitored closely to ensure that my heart rate was no higher than 130 per min. We waited and counted down the 24 hours required for dexsar to work. We didnt dare to hope for much, but celebrated every 30min. At first just to reach 6am (3.5hrs) than to 8:30am (6hrs where a quarter of the dexsar would have worked) than to 2:30pm (for the 2nd dose of dexsar to be administered at KK). We didnt believe that we managed to hold till then, I suspect not even the doctors. At some point, my heart rate went racing above 138 and blood pressure dangerously low at 94/54. They lowered the sulbutomol, and soon the contractions gotten so much worst that I thought I was going to deliver, they gave me the gas mask and I breathed in freely. We held on and they increased the dosage of sulbutomol partially as my vital stats stabilised. The target was 2:30 am 1/8/09 but by 10pm, I was post-dilated and the baby's head was low in the birth channel. I felt weak and told E that I could not go on. He was dissappointed. And I was dissappointed that he was. I mean, the objective was both lives, wasn't it? At this time the doctors came in and he asked again about the side effects of the salbutomol and told them that I was feeling weak. My faith in him thus restored. And the doctors decided that there was no point waiting further. It was 20 hours after the 1st dose of dexsar in KK was administered, the baby's lungs had more than a fighting chance. The 2 teams of doctors came in to the labour room, and the neonatal team was told to "be ready for resuscitation". I prayed as they pricked the water bag and I started pushing. 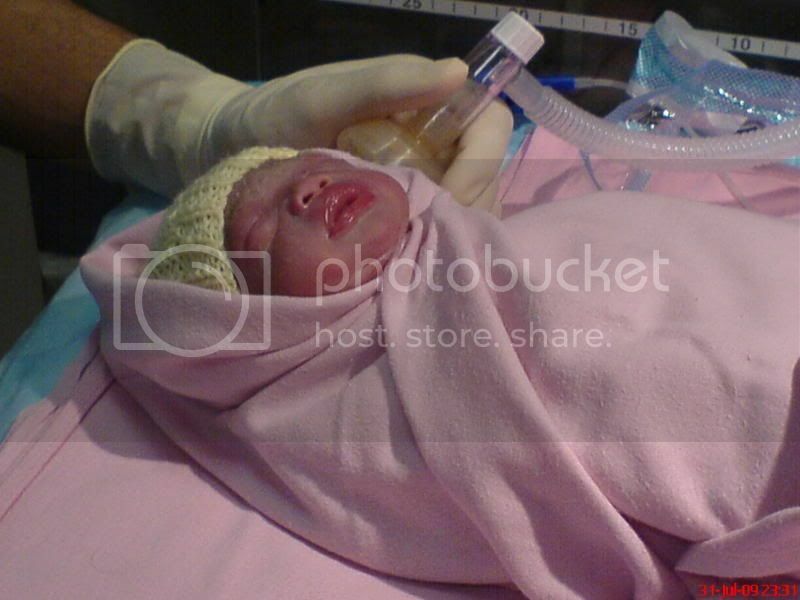 Baby V was born 1350gm, 41 cm long and 26 cm head circumference. Stats that were better than we had dared hoped for at such an early gestational period, and historical data from her elder petite siblings. A CRY! A small cry from the baby! She's breathing! She does not need resuscitation! That took everyone by surprised. She was quickly cleaned up and wrapped in cling wrap to preserve her body temperature. When she was ready to be pushed into the NICU, the neonatal doc gave E a slap on the back and congratulated him, telling him what a good girl we have there. We thank all who had helped and prayed for us.